SharkFest is a fun-filled, action-packed celebration of these much-maligned fish. 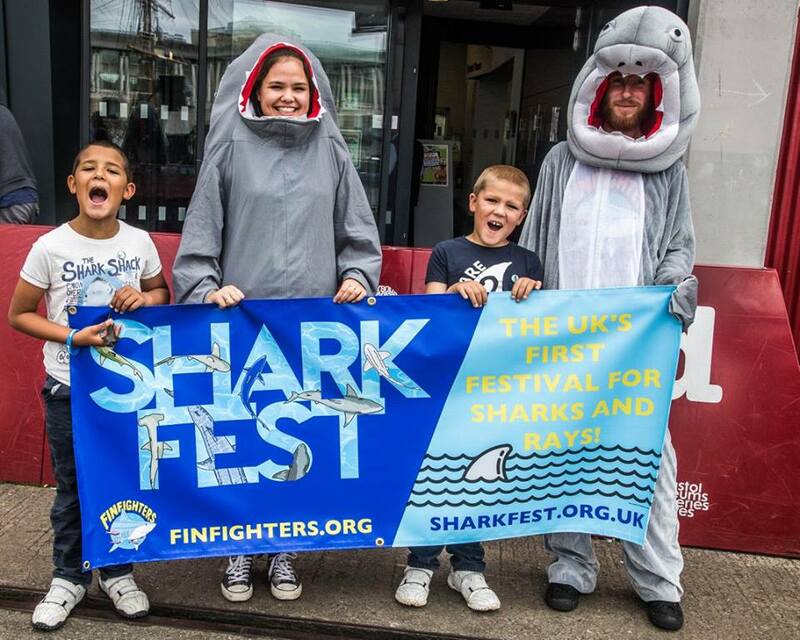 I spoke with Jasmine Tribe, Co-Ordinator of SharkFest to find out more about the festival which will be held on May 12, 2018 in Bristol, England. Q: Who is this festival for? Do you love the ocean? Do you enjoy photography, scuba diving, freediving or travel? Would you like to get into marine biology or conservation as a career? Do you want to help protect the environment? Do you want to learn more about sharks and rays in the UK? Do you want to meet inspiring, passionate and knowledgeable people? Are you looking for a family-friendly way to spend your Saturday? Is it a rainy day in Bristol and you want to try something new? If you answered YES to any of these questions, you should come to SharkFest this May! Q: What’s on show this year? I am super excited by our line-up this year! In the Speakers Room you can hear from: Basking Shark Scotland, Marine Megafauna Foundation, Sea Shepherd, City to Sea, The Blowfish, Blue Ventures, Manta Trust, Surfers Against Sewage, Fin Fighters and The Shark Trust. In our Exhibition Areas you will be able to participate in activities and chat with people from Fins Attached, Ghost Fishing UK, The Fins United Initiative, WWF, Fin Fighters, Zero Green, Frogfish Photography & Sharks4Kids, Wild Nature Press & Marc Dando, Shark Guardian, Love the Oceans, In Deep diving centre, Wise Oceans, OceanFox dive centre (presents Shark School by Erich Ritter), Manta Trust, The Shark Trust, Basking Shark Scotland, Blue Ventures, City to Sea and Surfers Against Sewage. If you’re coming with children I recommend seeing the Heavy Metal Marine Biology talk by The Blowfish, which promises to be a very upbeat session highlighting the awesome-ness of marine wildlife! The day will end with a talk from the director of The Shark Trust – Paul Cox – that was a huge hit at the last event. Lots of the organisations in our exhibition area bring activities and resources related to the work they do. We will also have a craft activity for kids to get creative and take something home with them! Q: What are you most looking forward to with this event? The excitement, the knowledge sharing and meeting people from a wide-range of backgrounds with a shared passion. I particularly love chatting to young future conservationists who are full of energy and passion me and give me hope for a brighter future for our oceans. This is some feedback that one of our visitors left at our last event and I think it sums it up very well what we’ve achieved! “Q: What had the biggest impact on you? I organise this event in partnership with Fin Fighters UK whose goal is to end the sale and distribution of shark fin in the UK by the year 2023. By building a larger campaign from a network of localised city pledges, Fin Fighters work to ensure that the UK government and the EU recognise the growing public demand for a shark fin-free UK. SharkFest UK brings together global conservation organisations, scientists, divers, surfers, teachers, artists, film-makers, families and shark fanatics; to encourage collaboration, positivity and active participation in marine conservation. Our goal is for shark conservation to have a bigger impact on the world stage through public education and partnerships between global efforts. Together we are stronger! So far, SharkFest has been held in Bristol, which will be the next city to join Cambridge in its pledge to be fin-free! Q: Sounds very exciting! Where can we get tickets? You can book a ticket online or buy one on the day, but I would advise buying in advance as we sold out at the last event. Tickets are £10 each and under 16 year olds go free! Tickets are available via our Facebook event page or Eventbrite. We’re promoting compassion for all and environmental conservation, so we ask that you come with a positive attitude and bring along a reusable bag and water bottle/ coffee cup! You will need cash if you want to purchase anything from any of the stands in the exhibition area. We hope to see you soon! Sharkfest will be held in Bristol, England on May 12, 2018. Head over to their website, Facebook page SharkFestUK, Twitter @SharkFestUK, or Instagram SharkFest_uk to learn more, and follow the hashtag #SharkFestUK18!